I'm always on the hunt for new things I can try out in my games. I keep a mental list of things I'm looking for and it sort of keeps me out of trouble while I'm online. On that list has been a good way to track my life when playing Magic since getting back into playing. Then I happened to stumble onto these while cruising Facebook last month. Designed for something similar, I thought I might be able to use them in my games beyond what they were originally intended for. Namely tracking my life when playing Magic. Figuring I could make them work, I decided to pick up two "counters" from TNT Laser Works. I got what's called a Command Dial and a Wound Tracker. Since this post talks about Magic and Space Hulk together, I broke it up into four sections. My initial thoughts on the counters, Magic applications, Space Hulk applications and then some final thoughts. Jump to the parts that interest you, skip the rest. These little things are sturdy. I don't know why I thought they would be flimsy and fragile, but they're anything but that. I was pleasantly surprised when I opened the box and saw them. 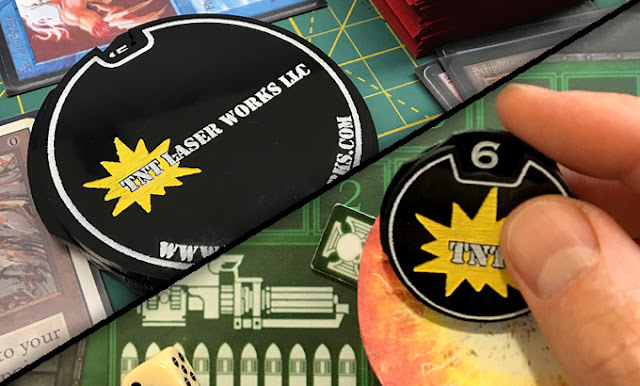 The Wound Tracker is about the size of a poker chip and the Command Dial is a good bit bigger at around three inches in diameter (the size of a small 40k blast template for those who used to use those). Both are about as thick as an Oreo cookie. The price seemed on the high end at first, but not too bad once I got them in my hand and saw how they're made. The fact you can customize these to your own liking makes the price right about where it should be for me. Customizing is something we as gamers have come to expect from companies and it's no different here. If the price were any higher though, I'd have opted out for a cheaper option. The number wheel spins smooth and has a built in mechanism to do what I call a "soft stop" at each number. That way, when you leave it on a number, it doesn't drift or change if it gets bumped or dropped. You physically have to change the number if you want it to move. The number wheel also has a slightly different shape that extends out from the dial faces allowing you to manipulate it in one hand. While the number wheel is a different shape than the top and bottom dial faces, all the outside edges are the same smooth surface. Sometimes my finger would slide on the number wheel as opposed to gripping it. I'd like to see the edges of the number wheel textured to make it easier to turn and differentiate from the top and bottom dial faces in your hands. It's not a big thing and I may be nitpicking, but a little texturing would be nice addition. Side note: I emailed the guys at TNT and mentioned this to them and they said they were going to test it out (the texturing) to see how it worked. This may be a new feature eventually, but until then, I just took my hobby saw and scraped it along the edge of my number wheel to give it the perfect amount of texture. No more slipping fingers. Here's where I thought the larger Command Dial would shine. I play Old School Magic online and until now have used a handful of dice to keep track of my life total. It works, but it's not the ideal solution. In all honesty, it's the best I could come up with until I found something better. It can be a double edged sword trying to keep track of life as you want it to be easy to do, easy for your opponent to see and something that isn't going to change if you bump it. Dice sort of work, but I have to pay close attention not to bump them or my table. The Command Dial I got goes up to 28. That's enough to keep track of my life and have some wiggle room should I gain any due to a Swords to Plowshares or an Ivory Tower. I don't often go above 20 though. Most of the time it's the other direction with a good bit of speed thanks to my always helpful opponent. I just leave the Command Dial on the table in front of me right next to my Library. When I take damage, I pick it up, tick off the correct amount and set it back down. Intuitive and super easy. Here's where I thought the Wound Tracker would really help me out. I already keep track of my Flamer rounds by the number of templates I physically have remaining in my hand. Those are easy to track. It's Marine command points each turn that were always giving me issues. 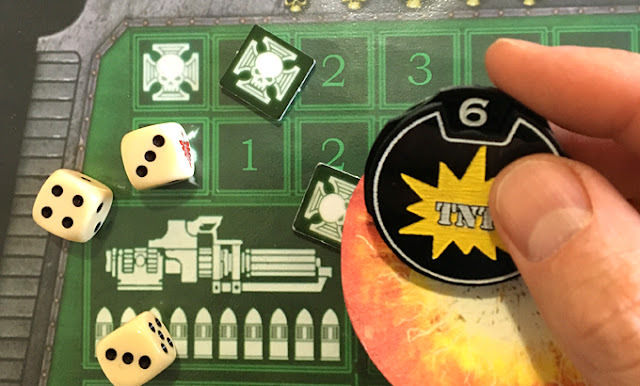 With the new system we use and even the original system, we found the little cardboard command chips were always getting bumped or moved or forgotten while the Marine player was frantically trying to get everything done in his allotted time. I found I can hold the Wound Tracker in my free hand along with my flamer templates while moving my Termies around. I don't have to keep going back to a tracking board to move cardboard chips along. One of the biggest things with Marine command points is the back and forth when deciding how best to use them. Use a command point; don't use one. We all do the back and forth dance with our Marines. Now the dance is much easier. This works great and doesn't at the same time. By holding the counter in your hand, your opponent can no longer see the amount of Command Points you've used so far by looking over at the command board. The fix is to just let them know when you're done with your turn as the Marine player how many CPs you've used. Something as simple as, "I'm done, I used 4 command points... your go." Then I set the counter down on the table in front of me. It shows how many I used and my opponent still does not know how many I have remaining (if any!). I prefer this over the old method because it allows me to keep track of my command points as I use them without being interrupted. I like to focus on my models as the Marine player and visualize who is going to move where in a given turn. With the old method, I'd just keep track of my CPs in my head as I used them (choosing to focus on my model moves) and then just push the counter along the command board when I was done. On more than one occasion I miscounted or forgot to add up something. Being under the timer and trying to do so much in a short time means you're bound to make mistakes. Having the counter in my hand lets me focus on the models without having to go back to the old command board. Doing that always seemed to break my focus and I quickly forgot the subtlties I'd planned a moment earlier with certain movements. In the process of playing, I discovered a few more Space Hulk uses as well. I could use a larger Command Dial to keep track of Librarian Psychic points. I could also use a Wound Tracker to keep track of Assault Cannon ammunition if needed. Old School Magic: This thing is perfect for keeping track of life when I play online and in real life. I can leave it on the tabletop and there are no worries if it gets bumped or whatever. In some ways it reminds me of the old metal Scrye counter I had all those years ago except this one isn't prone to falling over like mine always seemed to do. Space Hulk: I love this little guy for keeping track of Marine command points. It took me a few games to work out the best way to implement him, but being able to focus on my models is a big thing for me. I keep it one hand with my Flamer templates and can move around the table advancing Terminators on my turn without having to constantly go back to my side to adjust the old cardboard command chips. There are lots of ways out there to keep track of your life total, command points, ammunition, whatever it may be. The real trick is finding the method that works best for you. The one that doesn't cause more problems than it solves. ONE FINAL NOTE: While these counters are sturdy, they are not indestructible. I dropped my Command Dial down my stairs and watched it shatter into a million pieces in slow motion the other day. I'd grown quite attached to it in the short time we were together. I'm going to have to get another one, but nothing ever replaces your first. 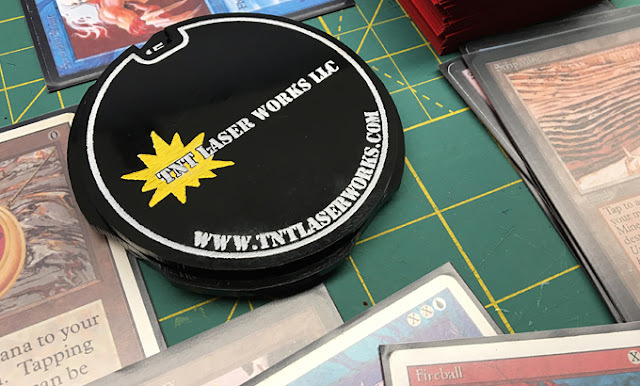 Disclosure: This post has been sponsored by TNT Laser Works. What exactly does that mean? I was not financially compensated for this post. I only work with those companies whose products I use myself. I received a sample for review purposes. This is my opinion based on my own personal experience with these specific counters. Image credit: Photos by me.